Dr. Lee Fuiman takes a voyage to the icy Antarctic. 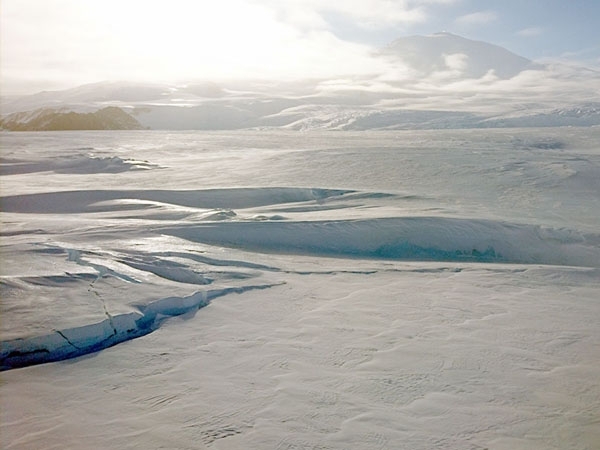 His mission: Understand how Weddell seals navigate under Antarctic ice. Follow us on Facebook to track his journey. Dr. Fuiman and a team of researchers from four universities are trying to understand how Weddell seals navigate under Antarctic ice. Weddell seals routinely dive for 20 minutes at a time and travel up to a mile from where they started before returning to their breathing hole in the ice covered waters of Antarctica. The biologists are using state-of-art video cameras and equipment to test their idea that the seals navigate underwater using Earth’s magnetic field, much as homing pigeons do. No marine mammals are known to be able to detect magnetic fields, so their research has the potential for new and important discoveries. The U.S. Air Force operated flights to McMurdo Sation, Antarctica from Christchurch New Zealand. Dr. Fuiman’s ride is a C-17 for the 5 and half hour flight down to “the ice.” Photo credit: Lee Fuiman. “Seating is pretty comfortable, but the lines for the toilet can be quite long,” says Dr. Fuiman. Photo credit: Lee Fuiman. This is Dr. Fuiman’s 10th trip to Antarctica. They use helicopters to help scout for seal colonies and the ice cracks that they need to breathe. Photo credit: Lee Fuiman. The scenery is picturesque. Mt. Erebus, an active volcano and Erebus Glacier, which extends over the frozen McMurdo Sound. Photo credit: Lee Fuiman. Seals, bottom left of image, gather along the coast where the tide causes breaks in the ice. Photo credit: Lee Fuiman. The multi-year project is being conducted at McMurdo Station, Antarctica, and is funded by the National Science Foundation. The project is a collaboration with colleagues at Texas A&M University – Galveston, University of California – Santa Cruz, and the University of Auckland.